The 35th Annual N.A.A.C.P. Freedom Fund Awards Banquet will be held Saturday, November 7, 2015, with a beginning a reception at 6:00 pm reception and dinner at 7:00 pm. This annual affair will be held at the Hyatt Regency Hotel with the theme of “The Walk Continues:”Stoney The Road We Trod”. 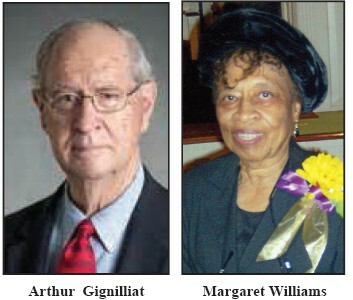 This year’s honorees are Mrs. Margaret V. J. Williams and Mr. Arthur Gignilliat. Mrs. Margaret V. J Williams is a native of the Long Star State, Texas, is a retired education. She is an active, conscientious productive, giving and caring individual. She believes that volunteering is love in action. She gives her love, time, talent, energy and resources to others in need. She gives generously to many charitable organizations. She has been involved in the Dr. Martin Luther King, Jr. Observance Association for over 20 years. She spends countless hours preparing educational materials, attending meetings and affairs of the Association. Working with parents of scholarship recipients, calling members, and business for the celebration. Mrs. Williams has been one of constant of this civil rights organization, as it has evolved from a small commemoration in honor of Dr. Martin Luther King, Jr. into one of the largest celebrations of its kind in the country. Through her support and work with the Observance Day Association’s Scholarship Fund, scholarships have increased. Her many years of dedicated services has truly earned her the title of Martin Luther King, Jr. Parade Marshal. Mrs. Williams has been a long standing volunteer for the Savannah Branch NAACP, where she paid her dues through the ranks and currently serves as a Diamond Life Member, she is one of the founding members of the Ralph Mark Gilbert Civil Rights Museum, she served as president of the Goodwill Industries of the Coastal Empire GIVS (Goodwill Industries Volunteer Services), and she was named Trustee of the year at her home church, St. Philip AME Church. Mr. Arthur M. Gignilliat, Jr. retired in 1997 as President and Chief Executive Officer of Savannah Electric and Power Company. During his 40-year career with the company, and following his retirement, he was actively involved in community and public service endeavors. He was elected to eight terms in the Georgia House of Representatives where he served on the Appropriations Committee and was Chairman of the University System of Georgia Committee. Following his service in the General Assembly he was named to the Board of Regents of the University System of Georgia by Governor Joe Frank Harris and was elected chairman in 1985. In 1998, Governor Zell Miller appointed him to the Georgia Ports Authority where he was chairman from 2000 to 2001. His past community service activities include: Chairman of the Savannah Economic Development Authority; General Campaign Chairman for the United Way of the Coastal Empire; President of the Armstrong State College Foundation; Chairman of the Georgia International Maritime Trade Center Authority; and President of the Chatham Artillery. Member of the Metropolitan Atlanta Olympic Games Authority, the Bethesda Union Society Board of Governors and the Rotary Club of Savannah. Educated in the public schools of Savannah, he is a graduate of Savannah High School, class of 1950, and Armstrong Junior College. He earned a degree in journalism from the University of Georgia and was awarded an honorary doctorate by Georgia Southern University. He is an elder in the First Presbyterian Church of Savannah. He and his wife Molly are blessed with a son and daughter, six grandchildren and three great grandchildren with two more due this year. For tickets or to reserve a table, visit the NAACP Savannah Branch Office located at 1204 Martin Luther King, Jr. Blvd., Savannah, GA 31415 or call 912-233-4161.